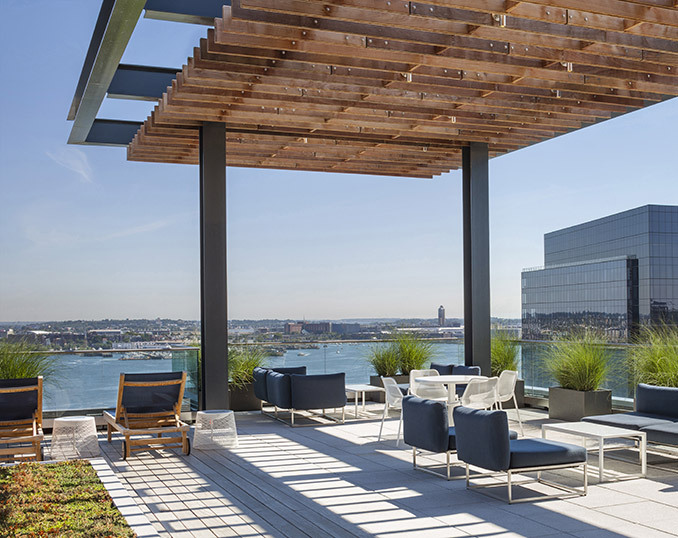 Located in Boston’s Seaport District, Seaport Square is currently being transformed into a 25-acre mixed-use development containing residential, office, retail, hotel, and civic/cultural spaces. Watermark Seaport is a 17-story luxury residential tower and 6-story loft consisting of 346 apartments, 25,000 square feet of retail space, and two levels of below-grade parking. The building is targeting LEED Gold certification. 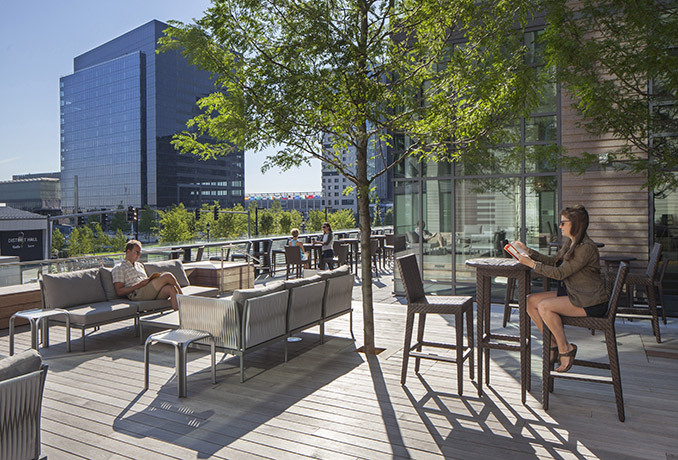 Copley Wolff Design Group was responsible for the landscape planning and design of the streetscape surrounding the building, an alley entry corridor, an amenity space/roof deck located on Level Two, and a tower amenity roof deck on the 18th floor. 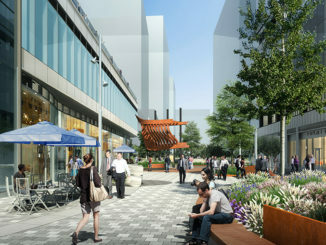 The landscape design concept focused on providing the building’s tenants with a unique high-end, semi rustic program that includes useful and flexible outdoor living amenity spaces and generous public sidewalks with designated furnishing zones. The streetscape design is divided into three zones: a furnishing zone, pedestrian zone, and frontage zone. 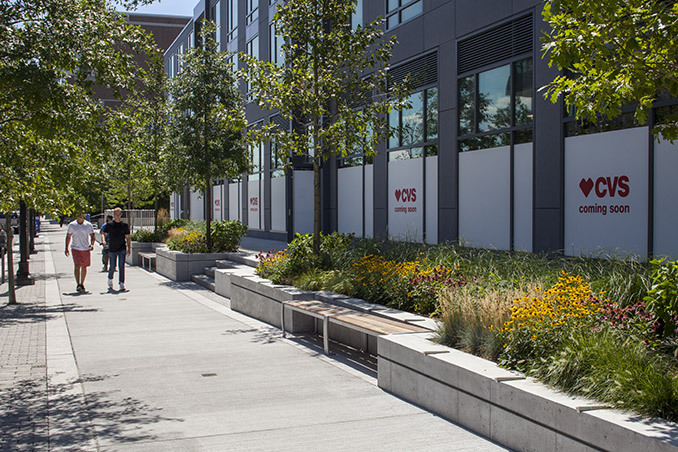 The furnishing zone is adjacent to the roadway curb and is comprised of street trees planted in structural soil, bike racks, signage, parking meters, and traffic utilities. 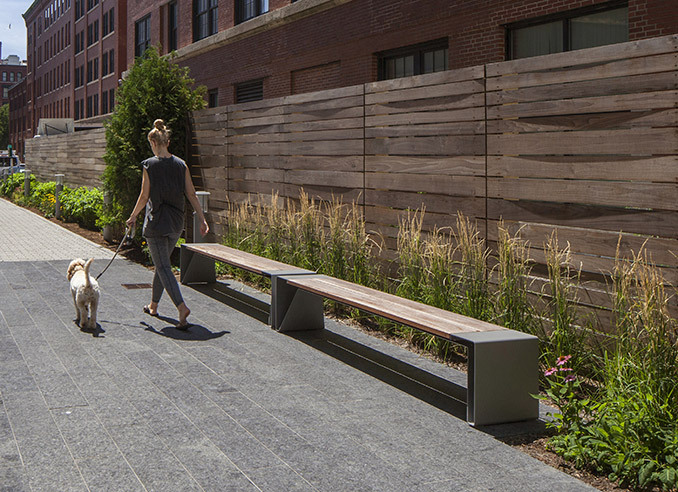 The furnishing zone is paved throughout with pervious pavers that infiltrate rainwater back into the earth, taking strain off of the overworked storm water system. The street trees utilize captured roof runoff stored in a large underground cistern. The pedestrian zone, paved in light colored concrete, is the dedicated walkway and provides unobscured pedestrian access down each street. 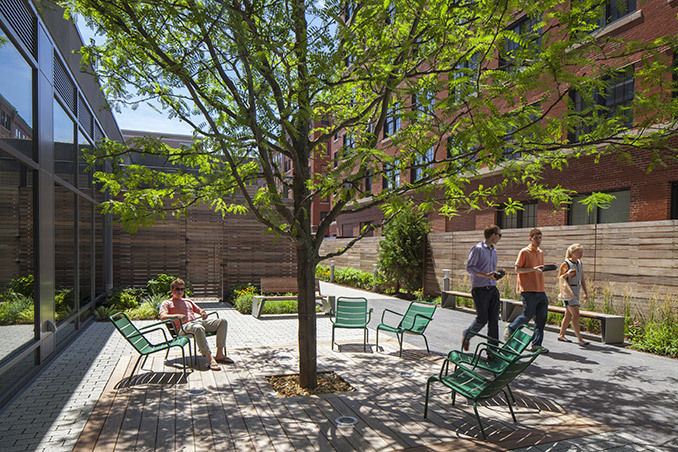 The frontage zone, adjacent to the building, consists of the Boston Wharf Road retail terrace, retaining walls, seating areas, and large shade trees. 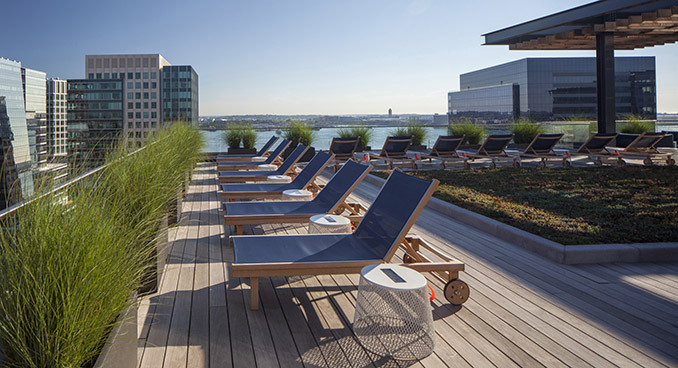 The roof terrace amenity deck, located on the 18th floor of the tower, was designed to provide active and passive gathering spaces for the residents while also capitalizing on the incredible views of the Boston Waterfront to the North and downtown Boston’s skyline to the West. The space is furnished with grilling stations, lounge chairs, lighting, a large steel and wood pergola, metallic planters with beach grasses, and tables and chairs for dining. 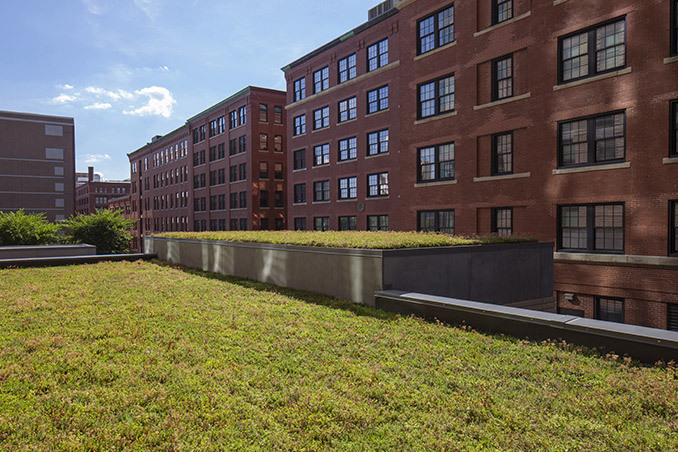 In addition, there is a large central green space planted with sedums which contribute to the building’s aim to achieve LEED Gold Certification. 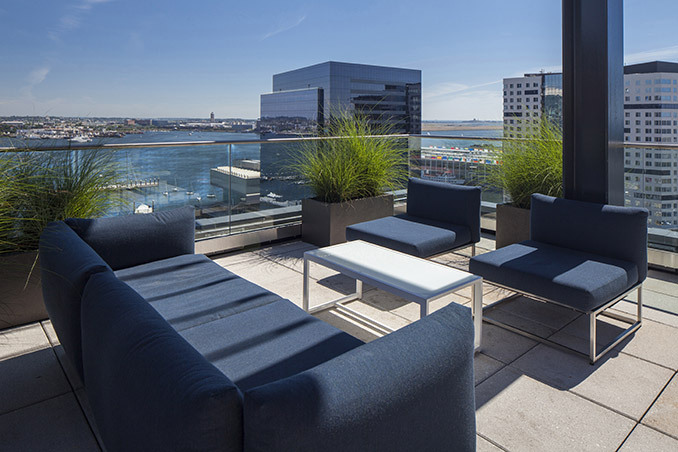 The second floor amenity terrace is located between the Tower and Loft buildings and abuts the busy Seaport Boulevard to the north. 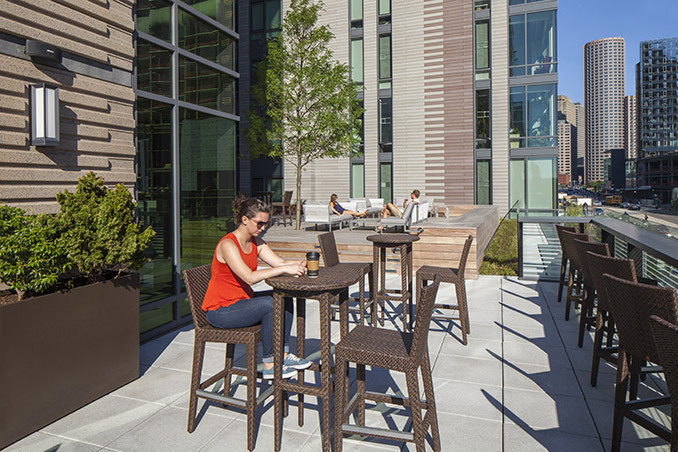 The terrace has three main areas, a planted zone with hardy sedum planting, an active zone with grills and dining tables, a flexible space for outdoor exercise, and a platform space designed with shade trees and a large wooden deck with extra wide stairs and lounge seating. The wood deck is furnished with contemporary outdoor couches, high top tables and stools, and built in wood seating throughout. 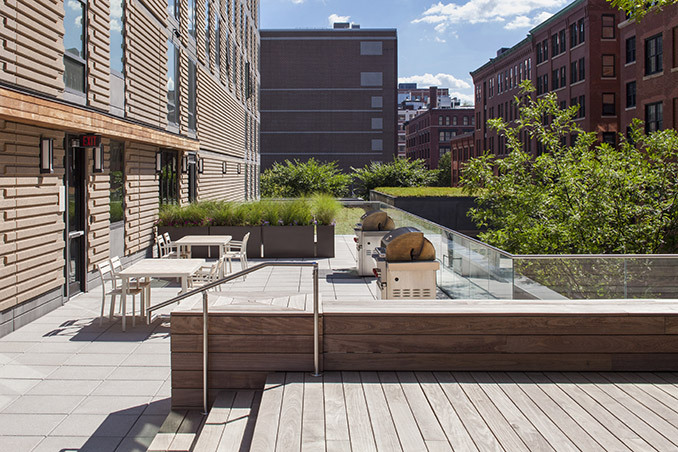 The roof deck was designed as an extension to the indoor lounge and entertainment rooms used by the building’s residents. Design Firm | Copley Wolff Design Group, Inc. Developer | A joint venture between Skanska USA Commercial Development and Twining Properties. Structural Engineer | Le Messurier, Inc.
MEP Engineer | Cosentini Associates, Inc.
Can landscape planning help get LEED certification?